A student Society at Bangor University, which has only been in existence for five months, has won national recognition for excellence. Student Midwives Samantha Davies, Jonathan Cliffe, Daisy Fenner, Sioned Jones, Hannah Heffernan and Rosie Florence, and the Student Midwife Society Committee Members at Bangor University, were placed in the top three for the Student Midwife of the Year Award, run by the British Journal of Midwifery Practice Awards 2015. 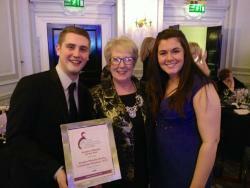 The success was announced on 23rd March at the British Journal of Midwifery Awards ceremony in London. The society committee made the decision to nominate the Society for the Award even though it was only founded in September 2014. The society has quickly grown in strength and has achieved a great deal in a short period of time. During the past 5 months, the Society has hosted its launch event, its first student led conference and held evening workshops for students. Future events include, fundraising activities, further evening workshops and conferences. The society runs alongside the Midwifery program to enhance the learning and educational experience of all students, enhancing and enriching their education through extra-curricular activities. A key aim of the society is to host study days and events that benefit those studying and practicing Midwifery at Bangor University and local health board hospitals.